Hox proteins and their cofactors in transcriptional regulation (M. Featherstone). Cdx homeobox proteins in vertebral patterning (M. Houle, D. Allan, D. Lohnes). Msx genes in organogenesis and human disease (R.E. Maxson, M. Ishii, A. Merrill). Prx, Alx, and Shox genes in craniofacial and appendicular development (F. Meijlink, S. Kuijper et al.). Role of Otx transcription factors in brain development (A. Simeone, J.P. Martinez Barbera et al.). Hox gene control of neural crest cell, pharyngeal arch and craniofacial patterning (A. Iulianella, P.A. Trainor). 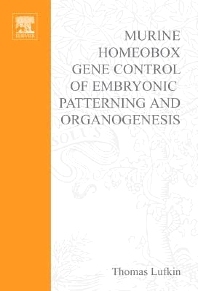 The first homeobox gene was molecular cloned nearly two decades ago, and since that time tremendous progress has been made in our understanding of the distribution of homeobox genes in the genomes of many animal species and the common functional role the encoded homeodomains play in cell-type specification, morphogenesis and development. The amino acid sequence of the homeodomain, as well as the presence of other conserved protein domains, has allowed the classification of homeodomain-containing proteins (homeoproteins) into over thirty separate families (e.g. Hox, Dlx, Msx, Otx, Hmx, Cdx etc.). In many cases a single gene has been shown to fully direct the morphogenesis and development of a complex tissue, organ or even an entire body segment. Yet how this "master" regulatory ability of homeoproteins functions at the molecular level to a large degree still remains a mystery, in part owing to our limited understanding of the nature of both homeoprotein transcriptional cofactors and even more elusively, the downstream targets of homeoprotein function. In the reviews presented here it is limited primarily to what has been learned in vertebrate systems, principally focusing on the mouse, owing to the strengths of the technical approaches currently existing in murine developmental genetics that are not yet available to the same degree in other vertebrate species. Despite this mammalian predilection, a common thread to each of these reviews is the underlying importance of what has been learned about homeoprotein function in other animal species, particularly arthropods like Drosophila.